Ron Chernow, Grant (New York: Penguin, 2017), 1074 pages including bibliography, an index, and 16 pages of black and white photos. U. S. Grant is an amazing story. Even how he came upon his name (which was latter joked to be Unconditional Surrender Grant) is an interesting story. At the dawn of the Civil War, Grant was broke, having failed in several business attempts. He had been dismissed from the army due to his drinking problems. Eight years later, after having led the Union forces to victory, Grant is the President of the United States. 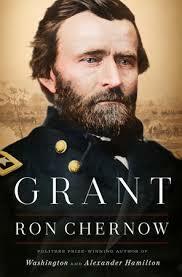 In this massive biography, Ron Chernow tells Grant’s story. Chernow challenges many of the presuppositions that are often held about Grant such as his military achievement was due to his superior numbers and that he, like his presidency, was corrupt. While acknowledging the truth of the Union superiority in numbers and the corruption of his administration, Chernow believes that Grant was a superior officer and he, himself, wasn’t corrupt. Grant’s greatest fault, according to Chernow, was his loyalty to friends. It appears Grant best action and clearest head was in the chaos of battle. In his private life he often overlooked the faults of his friends and was too trusting. In battle, he had no problems removing ineffective commanders. Grant is certainly a study in complexity. His father was overbearing, a successful businessman, and a strong abolitionist. His wife, Julia, came from a Southern Planter family and his father-in-law remained an unrepentant Southern even as he lived in the White House during Grant’s presidency. The two families hated each other. His father, who was critical of his son’s failures before the war, was proud of his son during the war even while he attempted to use his son for economic gain. His father, in business with two Jewish merchants, sought to benefit from Grant’s position in the western theater in order to acquire cotton. Grant became so mad that he banned all Jewish merchants from the army’s camp (a ban that was later rescinded). Grant would have to deal with embarrassments from his family for much of his life. Grant was a graduate of West Point and served in the Mexican War (and later admitted that he felt the war was unjust). After the war, he served in California and Washington Territory, before coming back East as a civilian. At the beginning of the Civil War, he volunteered as an officer and joined in Ohio. Grant rose to prominence following his wins in the Western theater of the campaign (where he became close to Sherman), he didn’t meet Lincoln until he was being made the General of the Army. In this position, Grant was able to coordinate the movements of all the armies of the North with a goal of not defeating the South on the battlefield, but of defeating the Confederacy. While much of the war had been fought with armies working independently, Grant, in 1864, coordinated the attacks on all fronts, a strategy that kept the South from shuffling troops from one front to the other and led to the end of the war. Grant knew many within the leadership of the Confederacy. He had been a good friend of James Longstreet since their time at West Point and after the war, the two continued their friendship. He had met Lee in Mexico, but unlike other Union generals wasn’t intimated by him. Grant’s strategy was to always keep pushing. Even if he lost a battle, he would quickly regroup and attack again, before his enemy was able to rebuild his troops. Often, in battles such as Shiloh, the first day was lost but because of continuing the attack instead of withdrawing from the field, victory (or at least reaching objectives, which he saw as more important) were achieved on the second day. During the war, Grant despised the guerrilla tactics of John Singleton Mosby, but after the war he, too, became friend and supporter. Mosby would later become the United States ambassador to Thailand. Grant and Lee had only one additional meeting after the war. Lee called on Grant about a railroad project and didn’t laugh when Grant suggested the two of them had done enough destroying of railroads for them to become builders. While Grant wasn’t intimidated by Lee, neither is Chernow, who challenges a lot of presumptions held about the Southern General. I found many interesting insights into this book. One was how Lincoln feared that Grant might decide to run for the presidency in 1864, something Grant denied. In many ways, he was a humble man. But he was married to a former Southern Belle, who delighted in the spotlight. I was also amazed that after Hayes’ presidency, who had announced early on that he would only serve one term, Grant considered (and other pushed him) to return to the White House. But his attempt at a comeback failed when the Republicans chose Garfield. While Grant’s presidency had its corruption, which Chernow deals with, I felt he tended to sweep allegations of Grant being beholding to business leaders (many of whom had given him homes and money) under the table. Chernow paints a picture of the President who was concerned about Reconstruction and the danger of losing that which so many men had given their lives. He was very concern about the way the “old south” was rising through the Ku Klux Klan. As a General, Grant found that black soldiers were just as good as white soldiers. It bothered him when he learned of former black soldiers being lynched in the South, yet he was also concerned about overusing force. Interestingly, Sherman, who was seen as less generous than Grant as he swept across Georgia and South Carolina during the war, took the side of the South after the war. Sherman suggested leaving states to work out their own laws. Grant knew that such a tactic would end up with a South in which African-Americans would be no better off than before the war and saw the government had a role to play in reducing violence. It was interesting to learn how Grant had his eyes on the United States acquiring Santa Domingo (today’s the Dominican Republic). He was also ready to go to war with Mexico, if necessary, to force the French out. Others in his cabinet had eyes on Cuba and it was even suggested that Great Britain give the United States Canada as payment from the damages of the British built Confederate ship, Alabama. After his second term, Grant became the first American president to make a round-the-world trip. It started out as a rest in Europe, but ended up being a diplomatic mission as Grant visited Egypt, India, Thailand, China and Japan. Coming back to the United States, Grant saw what financial security he had to evaporate overnight in a Ponzi scheme. Friends stepped in which allowed him to have a house in which to live. Mark Twain, who had befriended Grant, worked with him to write a biography. Grant, suffering from throat cancer, finished the book right before his death. Twain, who published the book, was able to present Julia with the books royalties of nearly half a million dollars, making it one of the most successful books of the 19th Century. Chernow deals with Grant’s drinking, suggesting that during the war he generally refrained from drinking in front of his troops (his drunken accounts were when he was away from the front). Grant had aides and a wife who worked hard to keep him from drinking. It appears Grant was mainly a binge drinker. As long as he avoided alcohol, he was okay, but once he started drinking he continued until he was extremely drunk. This is a well-researched study. Some may suggest that Chernow, in challenging many of the Grant myths, is playing in revisionist history. But it’s important to remember that many of the Grant myths that rose in the 19th Century at a time when the United States wanted to move beyond reconstruction. At this time, revisionist histories such as the “Lost Cause” movement became popular and united “white” America behind myths such as benevolent masters and the states’ rights. If you have time, I recommend this book. I listened to this book on audible (48 hours long—that’s a lot of time in the gym), but also read sections of the book at the same time. My knowledge of Grant is fairly superficial, so this sounds quite interesting. Probably more than I care to dive into any time soon, but it might appeal to my husband. As I think I mentioned earlier, Chernow burnt me out reading Hamilton and I just didn’t have the heart to tackle this book. If it has been around 500 pages, I probably would have bought it and read it. Listening to it on tape sounds more palatable. My family has a connection with the Grant family. My ancestors ran a competing leather goods store in Galena during the same years Grant was working for his father in his family’s leather goods store. I’m sure this is a fascinating biography. Kudos to you for reading it. A book with that many pages is a bit intimidating to me. I doubt that I’d take the time to tackle it. I really had no information on Grant so this was interesting. A 300/350 page book is my max. But I appreciate what I learned from you, reading this. Grant was a mover and shaker, that’s for sure. Wow, this is a big book. Thanks for summarizing it so that I don’t have to read it myself :). At one point in my life, I wanted to read a biography of every president. Then I learned that most of the good biographies are massive. Also, some presidents are so irritating that I don’t want to read about them :). Great review! As you might recall, I read Chernow’s bio on Hamilton last year (and saw the play) and loved it. I think he has a thing for writing about misunderstood historical figures! Great review, and I’m definitely going to read this one this year. I’m sure this is an excellent biography. Good to read your review.